* Cessily Kincaid is the daughter of an Irish-American family, with Ellis Kincaid as her father and Jill Kincaid as her mother, and is a cheerleader at a local highschool, in Portland, Oregon. One morning, after she turned sixteen, Cessily woke up to find her skin slowly being covered in some kind of metallic-looking liquid, but it did not stop there. Her body softened after being fully covered, and she found herself falling on the ground, as her entire body seems to have melted, and she struggled to keep a semblance of a form, just as her father finds her, who came to check on her after hearing her pleas of help. Her parents were at lost on how to deal with their daughter's latest change, becoming a mutant. While not outright shunning her publicly, they hid her, and didn't want to keep her, and tried to come up with a way to save themselves of the embarrassment of having the neighbors finding out their kid is a mutant. Thankfully, for all involved, Xavier intervened, offering Cessily a place where she could learn about her powers, an invitation her parents were all too eager to take and ship their daughter away. Her time during the school was full of ups and downs, just like any school period. There were less kids, though, as Xavier's school was just beginning, but Cessily managed to finish high school and control enough of her powers to feel confident enough to brave the world. Following her graduation, she enrolled in the Gotham University, where she now majors in P.E.. Initially, she thought going for P.E. would be meaningless and a waste of time due to her form, but she figures the constant activity might help her get a better grip with her abilities in staying solid. Although she has a sarcastic streak, she usually manages to keep herself from giving sarcastic remarks if the current situation is really serious. Cessily is happy and outgoing, keeping to herself only few secrets, prefering to be honest and open to her friends, with who she trusts, and wanting to make friends, even social outcasts. Cessily is loyal to nearly a fault to her friends, willing to fight tooth and nail, to the death, to protect the people she loves and cares about. She very rarely denies help, unless what asked to do is completely illegal. And even then, there are exceptions. Well, she is. Cessily used to be a cheerleader at the high school she attended to before her powers manifested. She is cheerful, and more than willing to share her happiness with her friends. Despite being calm, she isn't patient. Being told to wait when she feels the need to act only makes her get anxious and restless, often causing her to finally disregard the orders to wait and act on her own. Mercury prefers wearing pants over skirts, sneakers over heels, baggy sweaters for the cold, the classic tomboy girl. She also has a fondness of wearing a cap while keeping her hair in a ponytail. For someone with such a malleable, liquid body, her head is pretty thick and hard. Once she gets an idea in her mind, a goal set to achieve, very few things short of a telepathic brainwash can dissuade her from her goal. Mercury likes to see the bright side of hardships she and her friends are presented with. One big example of that is her hope that her parents will someday accept her back. Mercury's body was turned into non-toxic liquid mercury when her powers manifested, and has remained that way since then, unable to turn back to human form. Her power allows her to alter her shape by collapsing into a featureless mass, able to become as thin as a sheet of water, extending blades from her skin, or molding herself into different forms. Her ability to shape shift extends, so far, to the most basic of rudimentary weapons. She can extend up to five times her height, or become as small as a 3x3 foot area of nearly paper-thin thickness, which is the thinnest and smallest she can get. She is no longer a carbon-based life form, now that she's fully made of liquid metal, and therefore does not eat or breathe the same way as normal humans. Still, she consumes food out of habit as it makes her feel more human, and to make people around her more comfortable around her. Also, since she no longer has internal organs, she is immune to toxins, poisons, diseases, pheromones and gases that need a living body to act on. However, it also leaves her more susceptible to electric- and sonic-based attacks. Also extremely high temperatures can make it hard for her to keep a solid shape (think being inside a burning building, or extreme low temperatures can freeze her solid, but does not kill her (think Antarctica cold). Her powers also give her the ability to cling to solid surfaces and move her body at will even without overt locomotive features, by 'flowing' in the direction she wants to move. This also has the benefit of allowing her to flow up walls and around the ceiling, but her top speed while in liquid form is roughly the speed of a jogging athlete. Since she no longer has a living body, she's undetectable by spells which detect life. She's also harder to detect, influence, or harm her than other humans and most mutants by spellcasters using limbo-magic or any other magic schools which weakness is metal. She's resistant, but not immune. And in the physical territory, Mercury can no longer feel pain from physical trauma. Being hit by a blunt object, being pierced or being cut by something sharp do not harmfully affect her, unless either a part of her body is cut off, or she's hit with a heavy blunt object with enough force, which could stun her and temporarily incapacitate her by splashing her body over, which would take her some time to reassemble herself. Mercury's body is always in a liquid state, which she can remodel and reshape at will, allowing her to change her shape for her benefit in any situation. She can stretch any part of her body, up to nearly four times her original mass, although she can stretch longer if she thins herself out or 'hollows' her body while elongating. She can also mimic the shape of any object provided it does not have many details. A simple chair, a table, simple objects without any design details. She can also morph and flow AROUND objects, molding herself in its shape, becoming thin enough to not be noticed. She can also change her weight as well, becoming lighter the smaller she becomes, or heavier the bigger she is, as well. Cessily was a student at Xavier's Academy, participating and graduating in its first class, and is now in possession of basic access to the facilities for visitations, use some of the school's facilities and get minor help from the staff, usually in the form of advice. Everything Cessily knows about combat she learned once arriving to the X-school. Her current knowledge about combat relies mostly on self-defense moves, not relying on her powers, although she knows how to use her powers offensively thanks to all the training. Cessily used to be a cheerleader at her school before her powers manifested, and that required flexibility for the cheerleading stunts, which makes taking gymnastic classes almost a pre-requisite to being a cheerleader. That made her already quite quick in her reflexes and agile, even before her powers manifested. Thanks to her malleable form, disguising herself is not much of an issue. Plus the fact she can literally move without making a single sound while in liquid form, also being able to adhere to walls and ceilings make her a very good spy, even with the little training in the area she has. She is not on the best terms with her father and mother. They have shunned her for being a mutant, she still loves them and hopes to reconcile one day, and would do anything to have their love back. 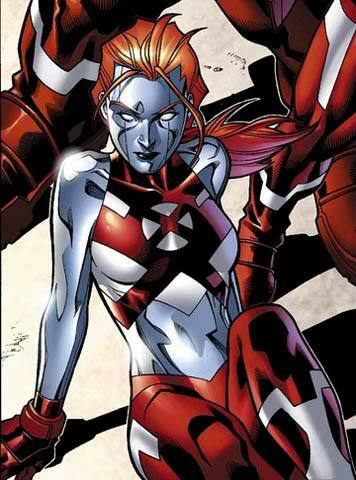 Unlike most mutants, Mercury's mutation is not only obvious to anyone who happens to glance at her, but is active all the time. Her whole body is made of shining metal, which makes blending in a crowd nigh impossible. One important, and VERY embarrassing thing about being able to melt, for Mercury is that she can only melt her SELF, meaning accessories like necklaces, bracelets, earrings, and even CLOTHES remain unchanged. In other words? When she reforms, she WILL be naked. Being made of metal leaves Cessily very susceptible to electricity. The same amount of electricity that could stun a normal person can easily incapacitate her or even knock Mercury out. As for extreme cold, it can cause her body to stiffen and become brittle, the colder it is. Effects range from impaired motor functions (movement and shape-change), to complete loss of movement (like a brittle frozen statue. Think T-1000 right before being smashed to bits, after being exposed to liquid nitrogen). To this point, imagine being tossed into the middle of the South Pole with no winter clothing; Likewise, extreme high temperatures can make it hard for her to keep her form solid. Being inside a burning building makes her slowly melt, like a candle. More than that speeds up the melting process. She's made of metal. That makes her vulnerable to magnetism. No, she won't run away from fridge magnets (although they do stick to her body), but going against magnetism in greater scale (like facing a certain X-Men nemesis) she would be as useful as a dead leaf amidst a hurricane.